Saint Hilaire-d'Ozilhan is a small village in the Gard department, a few km northeast of the Pont du Gard. St-Hillaire has a very small Medieval center, a slightly larger "old-town" center, and extensive surrounding habitation. No village café, almost no commerce (bakery, hairdresser).  Market day Tue. St-Hilaire-d'Ozilhan is a village with a Medieval history and some interesting nearby sights, but without café or commerce it's not a likely destination for tourists. The core of the old village is section of "squares" of little streets behind (south of) the town hall (Mairie), many with self-descriptive names, such as Rue de l'Ancien Village (Old Village street) and Rue de la Vieille Eglise (Old Church street), surrounded by Rue des Remparts where the defensive ramparts used to be. We also liked the name Chemin Derrière les Cours (Road Behind the Squares). The main street through the village is Ave Paul Blisson, passing in front of the mairie. The area on the north side of the main street is an old section of the village with longer streets and stone walls, with some villas and the town's one hotel-restaurant. The area surrounding St-Hilaire-d'Ozilhan to the south is farming land, with many vineyards and, just to the east of the village, some very large olive orchards. 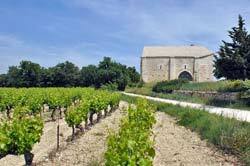 On a walk out the the southwest, such as on the road to the lavoir, you can see the nearby perched village of Castillon-du-Gard across the vineyards. Stretching across the north side of St-Hilaire-d'Ozilhan are low forested hills with some twisty little river valleys (usually dry in the summer). 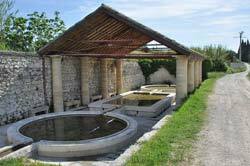 Medieval: The original village of Saint-Hilaire-le-Vieux was located at the site of an earlier oppidum on a hilltop 800 m northeast of the current village. Ruins of the earlier village, called Le Castelas, can still be seen there (a marked hiking trail leads there). A letter from the King in December 1441 authorized the demolition of St-Hilaire-le-Vieux and the construction in the new location of four walls, two entrances and a round tower at each corner. The GR63 Grandes Randonnées passes through the village of St-Hilaire-d'Ozilhan. This is a 134-km long hiking trail. It begins at Villeneuve-lès-Avignon, 20 km to the east. To the west the GR63 passes Castillon-du-Gard, the Pont-du-Gard and the Gorges du Gardon, via Quissac and Sauve and into the Cévennes. There are petite randonnée (PR) trails into the hills north of the village, one going past the Castelas ruins of the original St-Hilaire village. It's just over 5 km to the village of Valliguières, making that a 3-hour round-trip hike. South of St-Hilaire-d'Ozilhan is a very short PR loop hike to the St-Etienne Chapel. There are other loop hikes available, using a combination of the marked PR trails and the country lanes between the vineyards and olive groves. 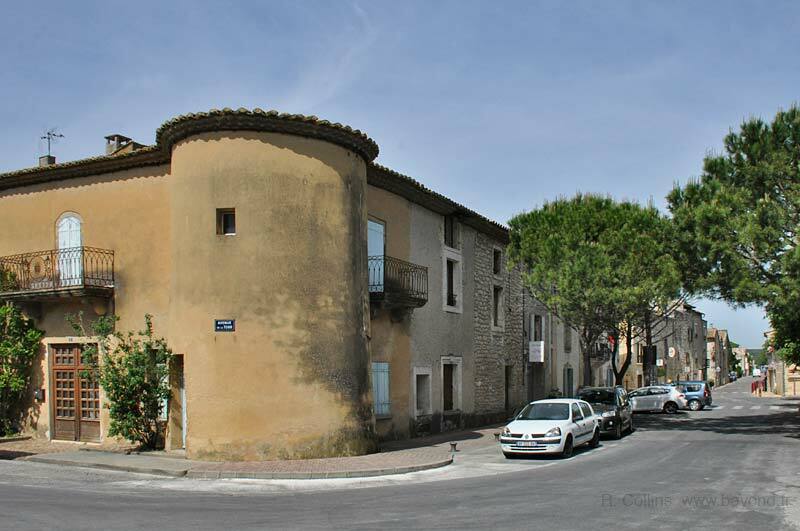 It's 2.5 km (30-40 minutes) from the village, south through the vineyards, to the ruins of the windmill of Aure (Moulin de l'Aure).